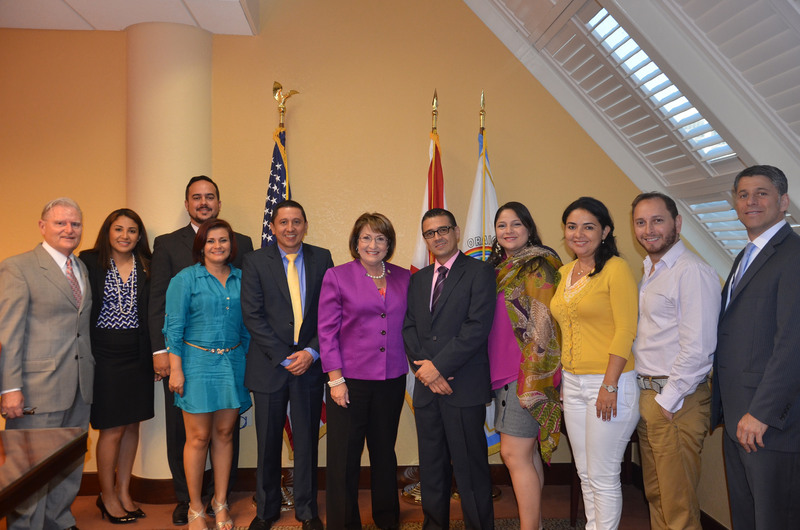 Orange County Mayor Teresa Jacobs and the Office of Economic Development recently met with distinguished faculty members from the Universidad Autonoma de Occidente (UAO) in Cali, Colombia and representatives from the University of Central Florida (UCF) Business Incubation Program to discuss the commercialization of science and technology and share academic resources and research practices. UCF’s Research Foundation and Business Incubator are supporting the team from UAO and leading the university’s new business endeavor by advising them on institutional policies, developing strategies for new technologies and training team members in the commercialization of technologies. “This meeting solidified the importance of having the bridge that connects our two different cities and two countries in order to support economic development and entrepreneurship through the UCF Business Incubation Program,” said Associate Director of the UCF Business Incubator Rafael Caamaño. Robin Phelps, with the Office of Research and Commercialization at UCF, is also advising the team and faculty during their visit to Orange County. The project is managed by Alexander Garcia head of the transfer Technology office at the UAO and Ricardo López head of the entrepreneurship Center at the UAO. Following the meeting with Mayor Jacobs, the team met with representatives from the Central Florida International Trade Office (CFITO) at the National Entrepreneur Center. CFITO is a regional hub for foreign entrepreneurs and international companies interested in doing business in Central Florida. CFITO also supports small businesses looking to export goods and services through international partnerships and resources. The team will also meet with representatives from the Hispanic Chamber of Commerce of Metro Orlando (HCCMO). Orange County has had a long-standing partnership with Colombia, specifically with Sister Regions Quindío and Medellin. These two Sister Region agreements assist in facilitating an exchange of best practices and promote economic growth in both countries. Mayor Jacobs has visited Colombia on two separate trade mission trips aimed to promote trade and business opportunities between Orange County and Colombia. Both trips were successful and solidified partnerships resulting in new collaborations and business opportunities. Expanding on these new accomplishments, new flights were introduced from Orlando International Airport to Colombia allowing increased tourism and business development between the two nations. A collection of photos from UAO’s visits with Mayor Jacobs can be found on Flickr.